Almonds, Walnuts, Peanuts, Cashews. I’m nutty about nuts. The pistachio reigns supreme in my eyes though. It’s the sophisticated nut. It’s also my favorite shade of green. There’s also so many cooking applications for pistachios– eat them right out of the bag, throw them in a salad or even incorporate them in dessert. Unless you have a nut allergy you haven’t lived if you’ve never tried pistachio gelato–it’s heavenly. Let’s talk about another one of my favorite foods, salmon. I honestly hated it growing up. Ask my mom and she will tell you one of the first things I would say when I arrived home from school was “what’s for dinner.” If her response was salmon, which was often, I would always cringe with disappointment. I don’t know why, but she was respectful of my salmon phobia and would always pick me up a piece of tilapia instead. Spoiled rotten! Years later I came to my senses (I blame my siblings for all my weird food aversions) and decided to expand my seafood horizons. Salmon rocks. And so do pistachios. I was so happy to learn that the combination of the two is perfect matrimony. I hope you agree. Preheat the oven to 450 degrees. Season the salmon with salt and pepper and place on a foil-lined greased pan, skin-side down. Whisk the dijon, butter and honey together and brush on salmon filets. Combine the bread crumbs, pistachios and cilantro in a food processor until thoroughly blended. 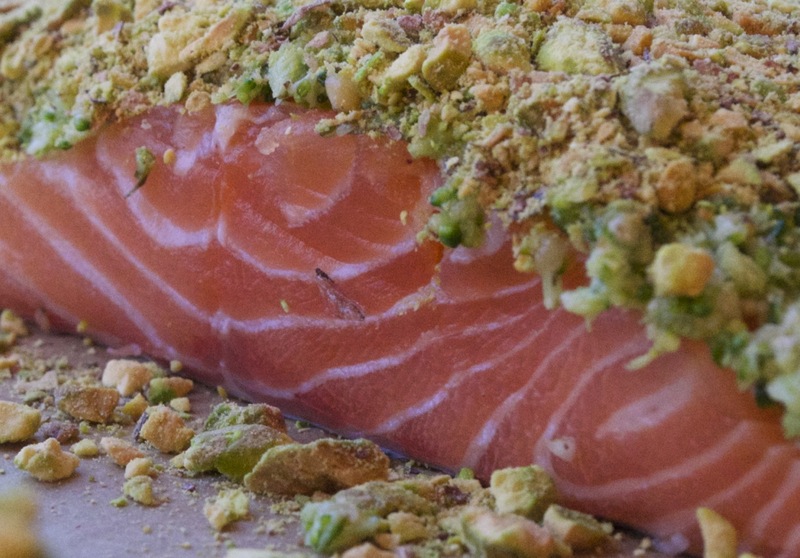 Coat filets with bread crumb/ pistachio mixture. Bake for 12 minutes until salmon begins to flake. Be careful not to over bake!